Chinese XO sauce is made using a blend of dried shrimp, scallop and pork as well as a host of spicy additions. I was bought a jar of it and it kept looking at me saying ‘use me, use me’ in the cupboard so use it I did. XO packs a punch so keep the rest of the ingredients simple as I have in this recipe. 1. Start off by making sure all the ingredients are prepped as once you get going this is super quick. Mix the rice wine, soy and XO sauce in a small dish and set aside. 2. Heat a glug of groundnut or vegetable oil over a medium/ high heat in a wok. Throw in the ginger, chilli and garlic and fry off for a minute or so being careful that the garlic does not start to burn. Pop in XO sauce mixture and cook for a further minute before adding the peppers for a further minute. 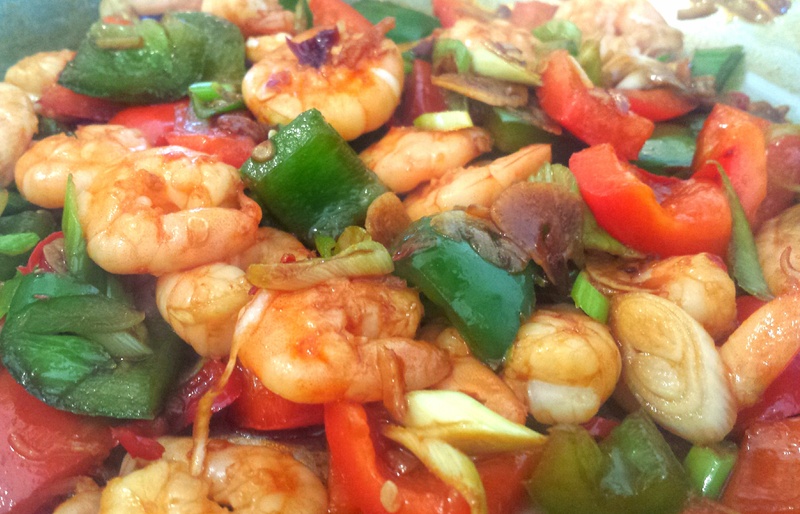 Make sure the peppers are well coated in the sauce and then in go the prawns. Cook until the prawns are cooked through and a gorgeous blush pink. Serve in warmed bowls with rice and get munching! You can also stir through some shredded spring onion at the end if you like which is also delicious. Spicy XO prawns- why stop there? Try it with chicken, pork or even tofu!